Only The Best Original Products, Lowest Price! You can View Other ZFI Quality products HERE. 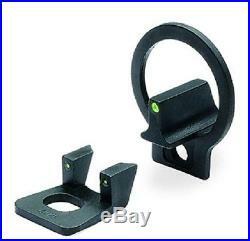 ML-31506 Meprolight Tritium Night Sights For H&K MP5, 91, 93, 94. An absolutely rugged , impact and shot-resistant, tritium- bright Night Sight set for your pistol. A favorite of military and law enforcement personnel with no patience for second-rate gear, Tru-Dot® Sights provide 3 bright tritium dots for fast, easy targeting in any light conditions. Installs easily with NO gunsmithing. Unequaled Low Light Performance. Used by Military & Law Enforcement. No transition from day to night use. Front dot is slightly brighter than rear dots. Sealed against water, dust and oil. Bonding seal on sight tube. Impervious to solvent bath for up to 48 hrs. Features of all Meprolight Tritium Sights. Self Illuminated light source – No batteries or switches, always ready when you need them. Operates under all weather conditions. The brightest night sights available today. Totally integrated day and night sighting. Can be mounted directly with no weapon modifications. Over 4,500,000 systems in use, worldwide. Tests by marksmen show an increase of over 85% in hit capability. H&K MP5, 91, 93, 94. Meprolight is a leading Electro-Optics company, developing, manufacturing and marketing systems for infantry, armed forces, law enforcement agencies and civilian markets since 1990. Meprolight provides comprehensive solutions with a wide array of combat-proven products. Optics – Optical, electro-optical sights and devices. Thermal Uncooled thermal weapon sights. Night Vision – Sights and devices. LRF- Laser rangefinders, hand held rangefinders and fire control systems. Tritium A variety of self-illuminated night sights and other tritium products. All of Meprolights products undergo meticulous quality assurance according to international standards. The company is certified to ISO-9001:2008, ISO-14001:2004 and OHSAS 18001:2007, complying with NATO and US military specifications and International MIL Standards. State-of-the-art technology combined with high reliability and simplicity of use have made Meprolight the vendor of choice among military forces, law enforcement agencies, defense agencies and weapon manufacturers. They are combat tested, perform in all situations, and are virtually indestructible. The item “ML-31506 Meprolight Tritum Night Sights Fixed Green Set For H&K MP5, 91, 93, 94″ is in sale since Sunday, December 31, 2017. This item is in the category “Sporting Goods\Hunting\Sights & Scopes”. The seller is “634zvi” and is located in Haifa. This item can be shipped worldwide.